Could Your Red Dancing Shoes Be The Secret To Healthy Aging? You Bet! Perhaps the song stuck in my head because, lately, I have been hearing a lot about the benefits dancing provides to us boomer women. While I intuitively know that dancing is a form of exercise, there are some other important health benefits that it seems to offer. One of these is helping women of our generation retain our independence in successfully doing what are known in the medical field as Activities of Daily Living (ADL). These include such things as eating, bathing, dressing, grocery shopping, and walking. A recent study followed some 1,000 boomer women over eight years to see how different types of exercise impacted their performance of various ADL over time. At the start of the study, all had excellent ADL ability (they were able to do all ADL tasks on their own without any assistance). During the course of the study, the women were asked if they participated in any of 16 different exercises. When the study concluded, about 13 percent (130 women) reported some form of ADL disability, which was defined as needing help in at least one ADL activity. The other result? Women who reported dancing had a 73 percent lower likelihood for developing an ADL disability. Perhaps what was even more astounding is that there were no significantassociations between the other 15 exercises studied and a reduction in ADL disability. Yes, you read that correctly. Only dancing made a difference in these women´s ability to continue to perform ADL tasks without assistance. While researchers did not give a definitive answer about why only dancing achieved this reduction in ADL disability, they emphasized that dancing requires a combination of skill sets that other exercises do not. These include balance, strength, and endurance as well as the ability to concentrate, respond, and react to a partner in addition to memory for choreography. The constant movement of dancing helps get our heart and lungs pumping, which improves cardiovascular health. This, in turn, reduces our risk for heart disease, stroke, and obesity. The really great news here is that we don’t need to be doing something as fast as an Irish Jig or Disco to get this benefit. Even a slow ballroom dance such as a waltz makes a difference. One of the greatest threats to our health as boomers is a fall. Since dancing improves strength, balance, and flexibility, it increases our stability which reduces our risk for injuring ourselves as we go about our daily activities. Dancing also increases our ability to walk faster, climb stairs better, and more easily maneuver around obstacles – such as our grandkids’ toys in the hallway. As a weight-bearing exercise that requires constant movement, dance helps our bones stay stronger. This equates to fewer broken bones and healthier joints. Boomers who dance report experiencing less pain than those who are more sedentary. One group of seniors (average age was 80) were able to reduce their pain meds by almost 40 percent after taking a 12-week, low-impact dance program. Dancing is hands-down our best bet for doing what we can to protect our cognitive abilities and reduce the chances of developing dementia. 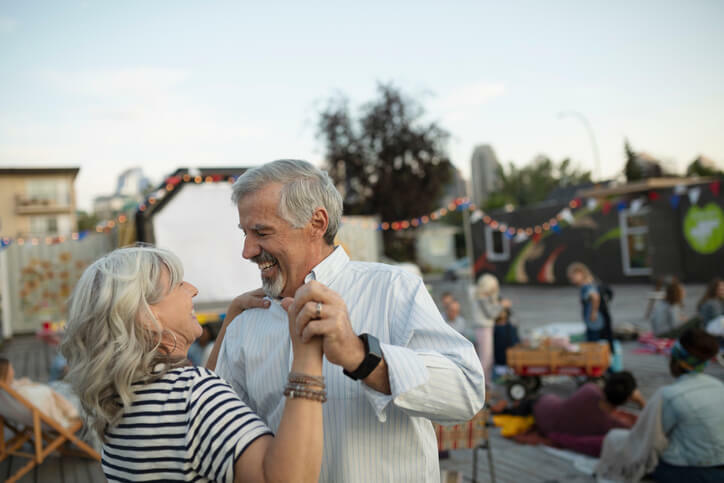 A 21-year study led by the respected Albert Einstein College of Medicine suggested that aging adults who danced regularly had a 76 percent reduced risk for developing dementia. As boomers, one of the greatest risks to our wellbeing is feeling isolated or not having access to the proven benefits of social interaction. These can contribute to depression, a negative outlook, lower energy, and a reduced zest for life in general. Dancing addresses all of these in a big way. As with any type of exercise program, before starting you first should check with a competent healthcare professional who has a knowledge of your medical history. You want to make sure that you’re healthy enough to start dancing (or do more of it) as well as know what limitations, if any, you may need to take into account. While some of us may be ready to start Zumba, others may need to start with something a little less taxing as we increase our endurance and stamina. Once you have the green light from your physician, you need to decide which type of dance might be best for you and what type of setting would help keep you motivated. Keep in mind that you will experience positive health changes even with only one hour-long dance class or session a week. Some of the more popular dance styles among us boomers are ballroom, square, tap, line, and even belly dancing. Of course, you may just want to do freestyle dancing where you just “do your thing” and have fun doing so. If you’re wondering where to go and how to go about getting started with dance, there are tons of options. If you decide on a class, you just need to google “dance classes near me” and you’ll have a good starting point. But before signing up, be sure to take a few minutes to talk to the instructors to see how much experience they have with boomers. You also may want to check out some online reviews. Finally, we all need the proper ‘fuel’ to be physically fit and perform well at whatever activity we choose. So, don’t forget to check whether you have a balanced amount of the macronutrients and micronutrients that will give you the energy to dance. These include proteins, carbohydrates, water, iron, calcium, magnesium, and zinc. Now, get out there and make Dave Bowie proud! What’s your opinion of dancing? Do you dance on a regular basis, either for exercise or just for fun? If you do, how often do you dance and what kind of dance do you enjoy? Do you belong to any organized social dance clubs or do you just do it on your own? What do you like about dance? Have you thought about dancing or is there a reason you don’t like it? Tell us all about it. Please join the conversation.